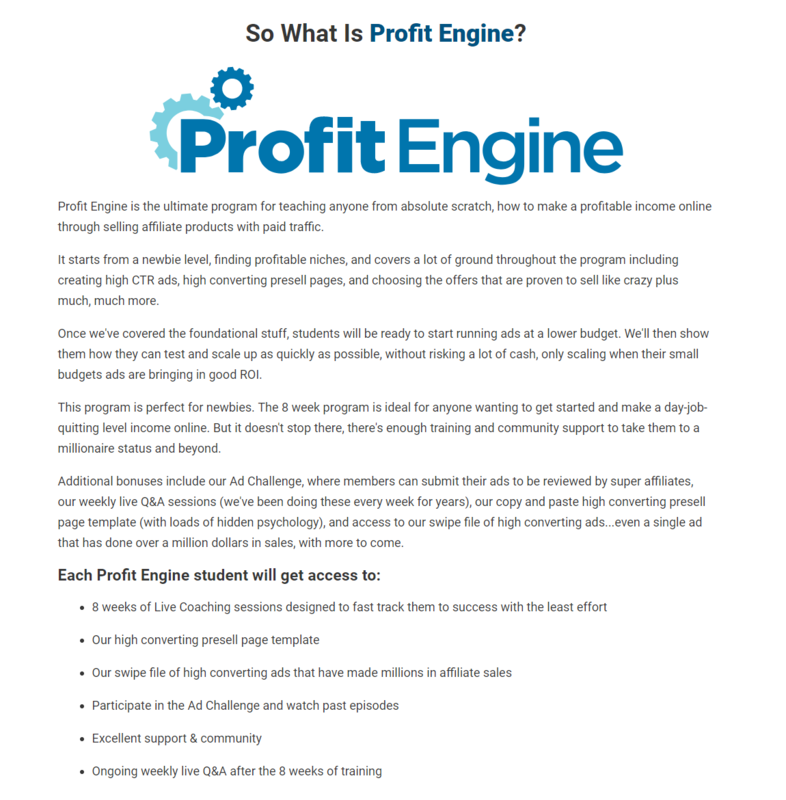 Implement and profit from THE SIMPLE 3-STEP 5-FIGURE PER DAY 'PROFIT ENGINE FUNNEL': You'll model and reap the rewards of the exact, dead-simple funnel Gerry used to become the #1 affiliate on Clickbank over and over again while making up to $22,227.45 per day using simple Facebook ads! You'll be amazed at just how fast you can put up your own virtual "ATM Machines" whenever you've got a bit of spare time. GRAB THE ONLY LANDING PAGE YOU'LL EVER NEED: This is the exact million dollar presell landing pages Gerry uses to make 5 figures per day and that turned our students into top super affiliates. Simply COPY our templates, change up the words here and there following our simple instructions, and you're good to go. 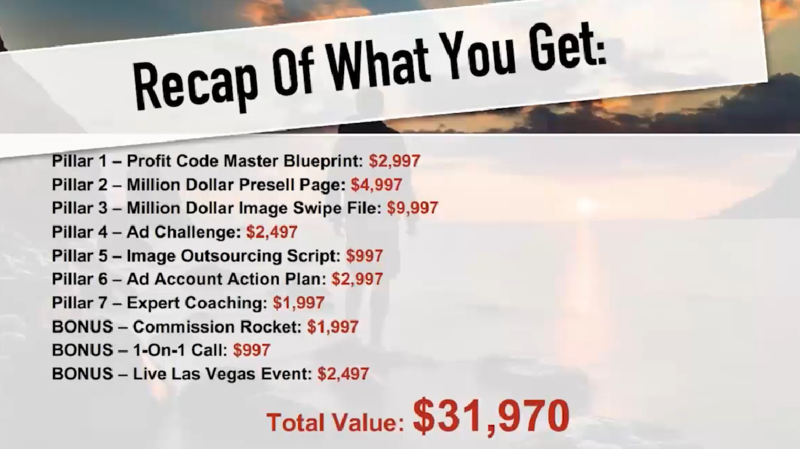 MODEL A MILLION DOLLAR FACEBOOK AD: Get a look at an ad that has made over $1 million in affiliate sales that you can model in your own campaigns. This is so simple it'll blow your mind. We've gotten clicks as cheaply as $0.08 for 37,101 clicks using this ad style. Cheap clicks AND big volume! This is a BIG SECRET to our success. Quickly and easily DOMINATE IN THE BIG NICHES, WITHOUT A BIG BUDGET: You'll use the same simple, yet wickedly effective tricks Gerry uses to dominate over the big boys in the biggest niches out there, and scale up to practically unbelievable heights as quickly as you want! You'll marvel as the problem of scaling up your business becomes easier to solve than you ever thought possible. GET THE TOP-SECRET MILLION DOLLAR IMAGE SWIPE FILE & CHECKLIST: Most people don't realize 95% of the success of your ad comes down to the image. This is a swipe file of images that are proven winners, so you can model your images after these. PLUS, you'll get the checklist that Gerry goes through every time he goes to create a new image for an ad. This alone is easily worth more than the price of the entire program. DO THE AD CHALLENGE - GET YOUR AD CRITIQUED BY A TEAM OF 7-FIGURE MARKETERS: Join us for the Ad Challenge...submit your ads, and we will critique them. Get your ad critiqued by Gerry, Rob and our super affiliate mentors. This is an INSANE opportunity, and NOBODY else at the top is doing this. NEVER WORRY ABOUT AD ACCOUNT CLOSURES AGAIN: For most affiliates, when their ad account gets closed, it's lights out. Not for us! With our simple ad account action plan, you can get your ad account shut down one day and be advertising again the next day! how come we have to pay for it? do we get instant access? What are you doing? You didn't notice that i refunded your payment? Last edited by spacecats; 07-16-2018 at 09:04 PM. hi Blackhatx does it come with the bonus software that was mentioned on the sales page? Last edited by jkoler; 07-22-2018 at 07:29 PM.